 The purpose of this project was to investigate the properties of polypropylene earthbags, and evaluate their potential as an option for viable low cost housing and possible disaster relief housing. CDT Dunbar did background research, and had to design and conduct an experiment to determine some of the basic properties of earthbags, which has previously not been done.  A prism test was conducted on earthbags using three different types of fill: sand, rubble, and dirt. The tests gave us the failure stress of the bags with the different types of fill (43.06 psi, 57.84 psi, and 311 psi respectively), as well as providing deflection data on the earthbags.  This project allowed me to do some background research on an interesting topic, and then use that newly acquired knowledge to design and perform a laboratory experiment, and make sense of the data that experiment gave me.  Dissemination: This report will be disseminated to LTC Karl Meyer C&ME, Dr. Lisa Wipplinger C&ME, and The Geiger Research Institute. Background: With the growth of our planet, and increasing impact of natural disasters on growing population centers, there is an increasing need for stable low cost housing world wide, especially in poorer countries such as Indonesia , Pakistan , and India . This has been highlighted in recent years with the devastating earthquake in Pakistan and India , the Tsunami in Indonesia , and Hurricanes Rita and Katrina right here in the United States . Emergency shelters have been slow in going up, and permanent housing promises to take even longer. Additionally, the cost is astronomically high to try to house that many people, and rebuild from scratch. Earthbags are a potential solution to these problems. The CalEarth institute in California has been working with earthbags since the early 1990's. They have built several domed structures that pass California 's strict earthquake codes, and the structures have survived earthquakes within that region. One of the focuses of these structures and their exploration of earthbags has been for the purpose of emergency relief sheltering. They have not performed any tests to determine the properties of individual earthbags, nor have any such properties of earthbags been published to this date (1). Earthbags are made out of polypropylene, which makes them resistant to degradation over time, and immune to rotting. They are sensitive to UV radiation, and must be covered during construction. A typical earthbag house is constructed by digging a trench to act as a foundation, an then laying the earthbags as masonry units. A barbed wire layer in between courses is often added to prevent slipping. A center pole is placed in the center, and the buildings are domed, with windows and doors having arches and wooden supports. The material for the earthbags is typically whatever soil is located nearby (2). More conventional housing built out of earthbags is being explored, but design is difficult without having the basic properties of earthbags. If a design can be established, earthbags will be a viable option for low cost housing. The average price of a concrete-masonry unit is about $7 (3). The cost of the earthbags for this project was $0.20 per bag. Earthbag units are also comparable in size, before compression, with CMU. The objective of this project is to determine some of the basic properties of earthbags, using several different materials. The intent is to determine the maximum compressive load a bag can take before it fails and is no longer of any use. Also, since we are dealing with soils, deflection is a concern as a building limit state, and will be measured. Both sand and dirt from the West Point area will be tested. Additionally, in pursuit of emergency relief goals, rubble will be tested as an earthbag fill. This explores the possibility of using the rubble from a natural disaster to rebuild the community. Theory: There is no set standard on how to test earthbags within the engineering community. Earthbags share properties similar to both masonry units and the material that they are filled with. For this test, the earthbags will share properties with sand, soils, and the various concrete and masonry units that make up the rubble. The prism test for the earthbags is modeled after the standard prism test for masonry units according to ASTM E 447. The test was expected to produce failure of the earthbags along the seams on the outside of the bag, and at the end where the tie is. The goal of the test is also to fail the bottom bag by maximizing the load on it. Additionally, deflection will be measured, to determine if deflection or compressive strength controls when using earthbags. For the purpose of the test, failure of the earthbag will be considered catastrophic tearing in the bag causing a sudden drop in strength and compromising the integrity of the bag. Instron testing machine, 9 earthbags full of material, catch basin, load distribution device, metal plates, and a ruler. 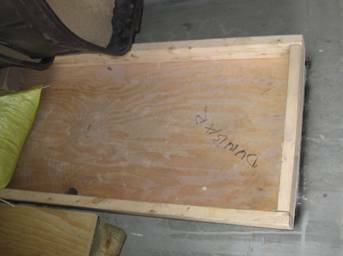 The catch basin is simply a small box made out of plywood with 2x4 pieces of lumber creating the sides. The purpose is to catch any material that falls out of failed bags. The catch basin can be seen in Figure 1. The load distribution device is simply a 2 ft. by 2 ft. wooden device constructed by 6x6 pieces of lumber and plywood on the top and the bottom, and can be seen in Figure 2. Each piece of equipment and each earthbag are weighed at this point before any testing begins. For each run, three earthbags are used. They are stacked directly on top of each other as in a standard masonry test. They are stacked in the center of the catch basin, with the tied ends of the bag facing the same direction. Each bag is hand flattened so that they do not stack eccentrically. The load distribution device is then placed on top of the earthbags, centered, with the long axis of the 6x6's running parallel to the long axis of the earthbags. Finally, the metal plates are placed on the center of the load distribution device, to spread out the load from the loadhead of the Instron machine. The entire setup is then moved directly under the Instron machine. The test setup is depicted in Figure 3. Setup the test on the computer. Testing for this project was done using Bluehill Software designed for the Instron machine. A standard compression test is built into the system, and is the test used for this prism test. 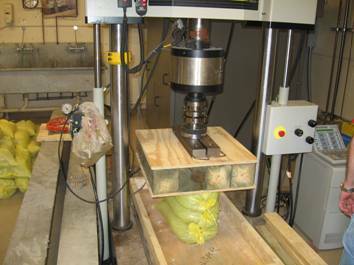 The test is deflection controlled, so the machine is set to extend at 0.5 in. per minute. Readings are taken every second, and total extension of the machine and total compressive load are recorded and graphed. The Instron machine only has a stroke of 5 in. and the compressive force does not go over 10,000 lbs. so the test will need to be reset when either of these two limits is reached. The data can be merged afterwards, and creates a single continuous data set. Measure the height of each bag, and the distance of the bottom bag to the left and right side. Record these measurements. Jog the load head down until enough force is applied to the setup to prevent side to side movement. Zero the extension and the load on the machine, and start the loading program. Observe the bags for any failures and watch the graph for any evidence of failure. End the test when the bags can not take any more load, or if the bags can not deflect any more but have not failed. Move the load head up and pull the setup out from under the machine. Remove the earthbags, recording final heights and distances to the side. Also record any failure of the bags. Save any material for future testing with the bags. Repeat steps 2 through 4 two more times for the same material. Repeat the entire process for the other two materials. The materials used for this test were rubble, sand, and dirt. The failure of the bags did not occur as expected. The bags only failed according to the definition in the theory section during the sand and the rubble tests. The failure that did occur in the bags was located down the center of each bag, along the axis that abutted the adjacent earthbags, as seen in figure 4. 5 prism tests were run for bags filled with sand, and 3 prism tests were run each for bags filled with dirt and rubble. Figures 5, 6, and 7 show the compressive load versus the extension of the load head for sand, rubble, and dirt respectively. 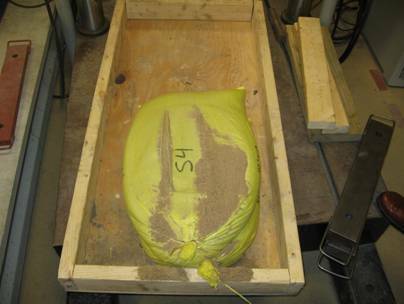 The sand test produced a compressive load of approximately 9000 lbs before initial failure of the bag. After initial failure, the bags continued to pick up load until it surpassed the initial failure point. The tests that were carried out till the sand could take no more load reached a maximum of 20,000 lbs. 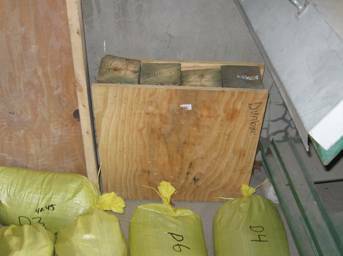 The average stress in the sand filled bags was 43.06 psi at the point of initial failure, with the average contact area of a bag being approximately 209 square inches. There are two irregularities to note in Figure 5. The first is test PS1, which loaded much faster than the rest of the tests, and failed initially at a much higher load. There was no difference in this test when compared to the other 4, but if the bags were unusually strong that would account for the higher strength. Test PS5 was loaded slightly eccentrically, which would account for the larger drop in strength at failure. The rubble test produced a compressive load of approximately 12000 lbs before initial failure. In the rubble test, the initial failure was a catastrophic failure of the bag that rendered it useless from that point on, and it did not continue to pick up load. The stress on the rubble bags was on average 57.84 psi at the point of failure. There were no irregularities with the rubble test. The dirt prism tests yielded results that were entirely unexpected. Looking at Figure 7 you will see that the bags never fail. This was made clear when the earthbags were removed, there was only minute tearing in three out of the 9 bags. The tests were run till approximately 65,000 lbs of force were put on the bag, or 311 psi. The bags loaded faster than the test could handle due to the compaction of the dirt at that point, so the limit state with dirt filled bags is clearly deflection. Deflection results can be seen in Appendix B. Deflection is a limit state to consider when building with earthbags since the average deflection for all three materials was over an inch and a half. Conclusion: From the prism compression test we were able to gather a rough estimate of the basic loads that earthbags can take. Clearly, dirt is the preferable material for ability to take load, but the dirt deflects more than the other materials. Deflection is s severe constructability limit state as all of the materials deflected more than 30% vertically. More testing will need to be done, to include shear testing, tension testing, and more thorough deflection testing in order to determine more properties of these earthbags. 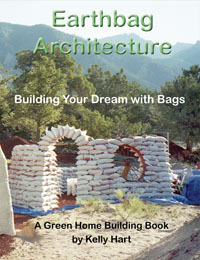 Overall, the earthbags show promise as a low cost building alternative. Very cheap, and easy to construct, they have proven durable under loads that will be seen in a single story residential home. More testing should prove the reliability and usefulness of earthbags. 1. "Emergency Shelter". Cal-Earth . Accessed 24 January 2006 . 2. Silverberg, Bruce A. " Colloquium Revives Ecological Building and Communal Values ". Network Earth . Available from www.networkearth.org/naturalbuilding/earthbags.html. Accessed 31 January 2006 . 3. Dunbar, Scott. Verbal discussion with author, West Point , NY , 14 May 2006 . The work presented in this report is the product of engineering STUDENTS at the United States Military Academy. While we strive to produce a high-quality product, the work herein has not been reviewed or endorsed by a Professional Licensed Engineer. As such, all recommnedations, assertions and observations in this report are for information purposes only and should be confirmed by a Professional Licensed Engineer prior to the implementation of any course of action.